There’s definitely an air of prestige that comes with whipping out an Armani foundation instead of L’Oréal. Or buying the vitamins you’ve seen all over Instagram instead of the Costco variety. Strip away the fancy brand names, and all you’re left with is an empty bank account. There is a ton of affordable products that are just as good — if not better — than their expensive counterparts, so there’s no need to lean into marketing hype or labels. Even if the item is plastered with logos like it’s still the ‘90s, you definitely won’t realize a difference in quality. Save some serious cash with our A-to-Z guide to common makeup, clothing, and food items in which the affordable version holds its own against the more expensive product. Honestly, the only thing you’re getting when you buy the more expensive product is scammed. 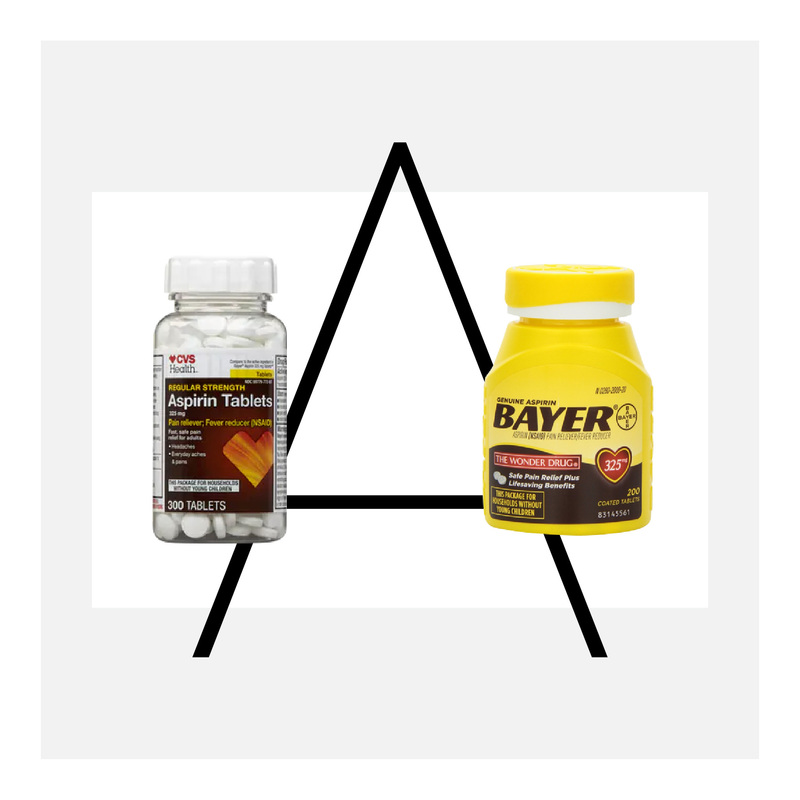 Aspirin is aspirin, no matter what the label says. 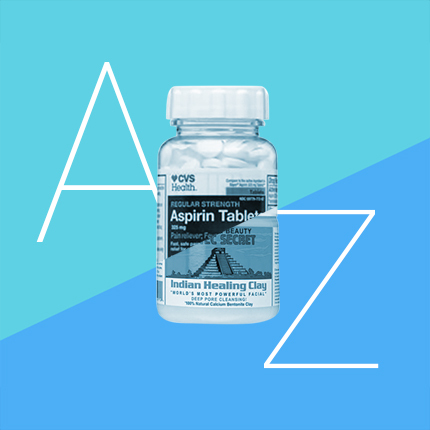 It’s the main active ingredient in Bayer, the CVS version, the Walgreens version, and every other bottle of aspirin on the market, so the clinical benefits of each are literally the same. According to the U.S. Food & Drug Administration, generic drugs cost an estimated 85 percent less than its brand name counterparts because generic drug applicants can apply for an “abbreviated new drug application” after the brand-name drug’s exclusive patents expire. This allows generic brands to leverage the existing research from the brand-name drug and skip repeating expensive clinical studies required for safety and effectiveness. Generic drugs are still required to pass certain regulations so they’re just as effective as the brand name. Think: Same-same but different. If that doesn’t convince you to buy generic aspirin, according to a 2015 research paper published in The Quarterly Journal of Economics, economists found that pharmacists buy the store brand versions of medicine 91 percent of the time. So if generic is good enough for the people creating and selling you aspirin, it’s probably good enough for your hangover. 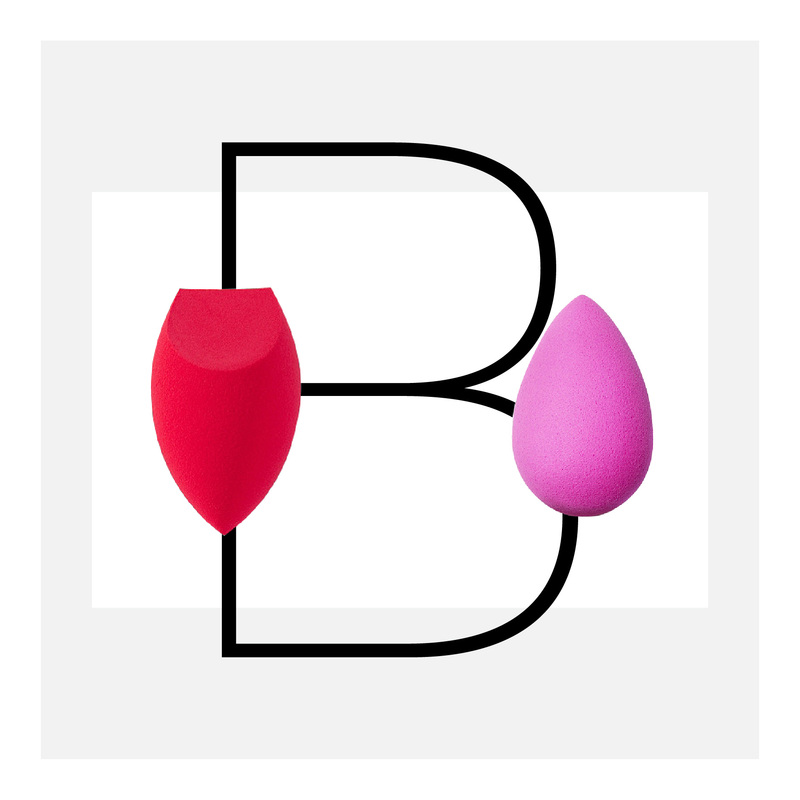 Even if you have no idea what a beautyblender does, you’ve seen that hot pink, egg-shaped beauty sponge everywhere — which means a ton of people are getting played into paying way too much for a piece of foam. The classic beautyblender costs $20 and comes with a friendly suggestion to replace it every three months, so you’re actually looking at $80 a year for a beauty sponge. If you’re willing to spend that much, try doing your makeup with the $7 Morphe Highlight & Contour Beauty Sponge and see if you can notice a difference. The soft-but-dense sponge has several different “ends” that help apply and blend your foundation, highlight, and contour to perfection. Even mega YouTubers Jaclyn Hill and James Charles have sung Morphe’s praises. When it comes to cashmere, Uniqlo is definitely a better value than Everlane. 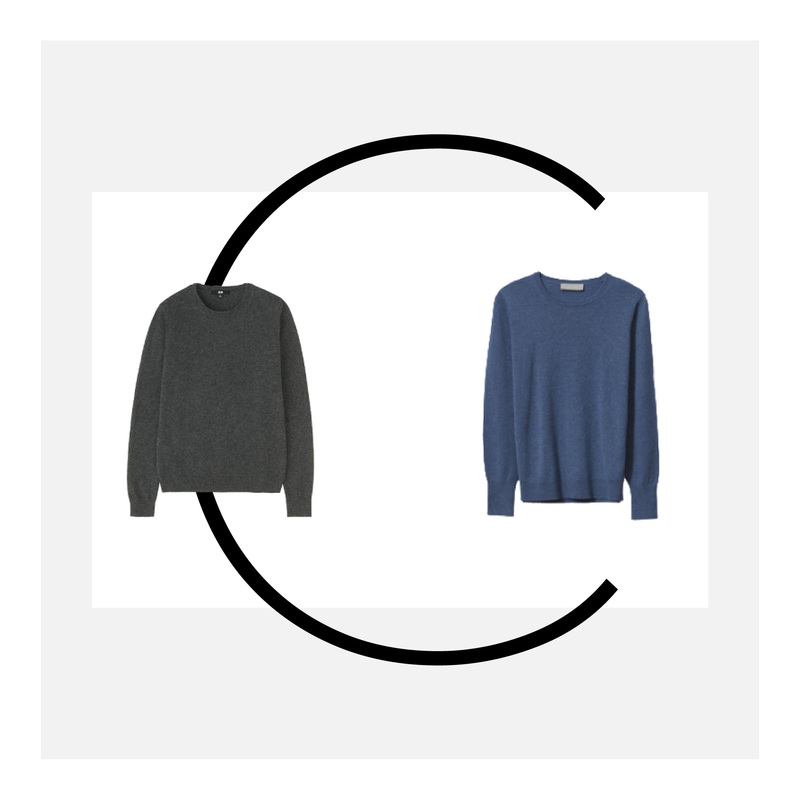 Both retailers offer 100 percent cashmere sweaters, but despite Everlane’s direct-to-consumer mission statement and transparent pricing methods, the price tags tell a different story. Uniqlo’s cashmere crew-neck sweater goes for $79.90 and goes on sale quite often, while Everlane’s is at $100 and rarely discounted. If the label says 100 percent cashmere and it’s made from a reputable retailer, there’s no point in forking over the extra cash. Feel free to spend the money you’re saving on a second sweater. For less than $15, celebrity hairstylist Kristin Ess (the woman behind Lucy Hale, Jenna Dewan, and Lauren Conrad’s flawless locks) has delivered the ultimate multi-tasking dry shampoo. 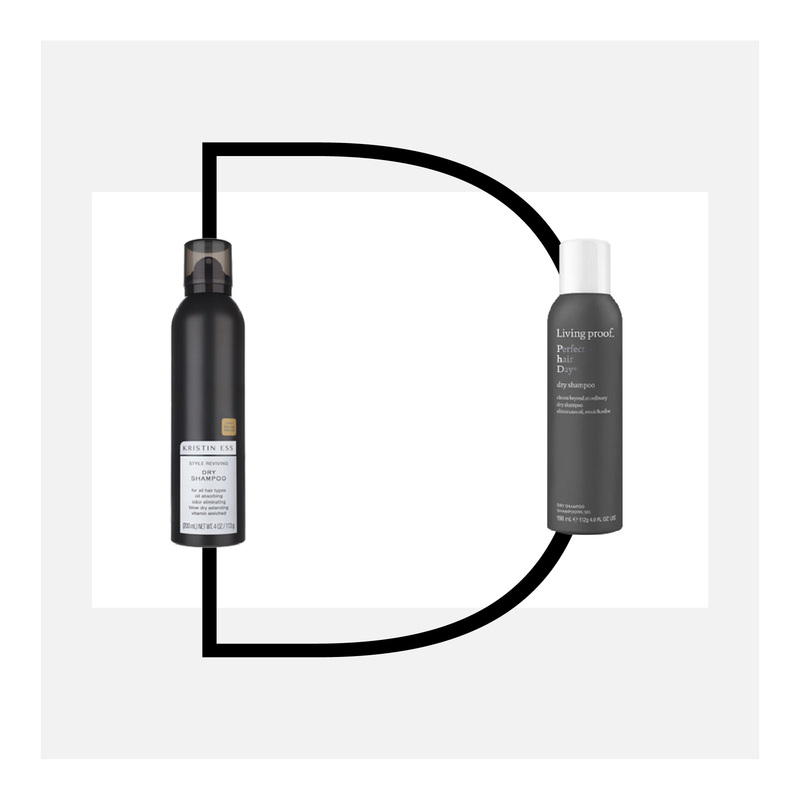 While some formulas make your hair feel sticky to the touch, this one soaks up greasy roots, adds volume, and gets rid of odor without creating that feeling. It’s also only $14, which is cheap enough for you to order several at a time without feeling guilty. 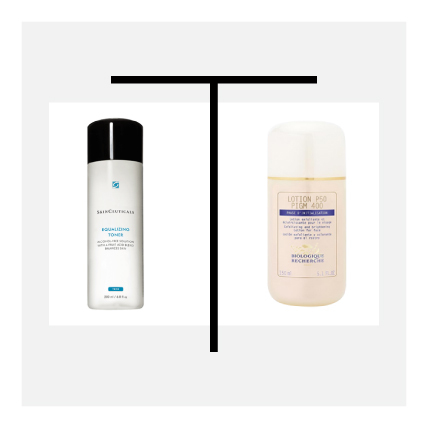 Compared to Living Proof’s $24 Perfect Hair Day Dry Shampoo, which does the same thing but also leaves behind a gray cast — obvious choice which one is worth your hard-earned dollars, no? Skin-care isn’t one of those things you should skimp on, but just like with generic drugs, if the key ingredient is the same, you’ll be just fine with the less expensive option. Case in point? Pitera, which is the main and proprietary ingredient in SK-II’s iconic essence treatment (the super-hydrating step before moisturizer). But don’t get it twisted — it’s just a fancy term for “fermented yeast,” which is also a key ingredient in Missha’s essence. The main difference is that a 5.4 oz. bottle of SK-II costs $179, while a 5.07 oz. bottle of Missha costs $49. 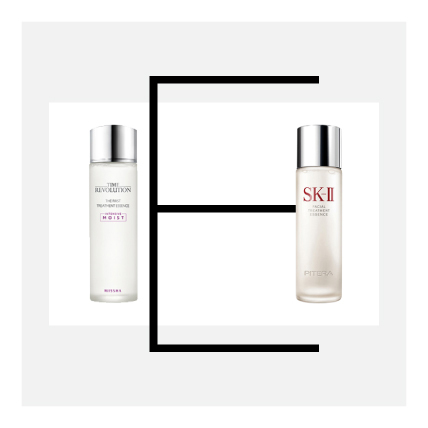 Both formulas highlight fermented yeast as their hero ingredients; SK-II says its formula is made with more than 90 percent fermented yeast, while Missha’s is at a flat 90 percent. The other 10 percent in Missha’s formula is a whole host of good-for-your-skin ingredients that SK-II’s doesn’t have, like niacinamide to brighten, exfoliating lactic acid, and moisturizers. For $179, you would think that you’re getting a lot more than just fermented yeast. When it comes to foundation, once you find The One, you don’t deviate. 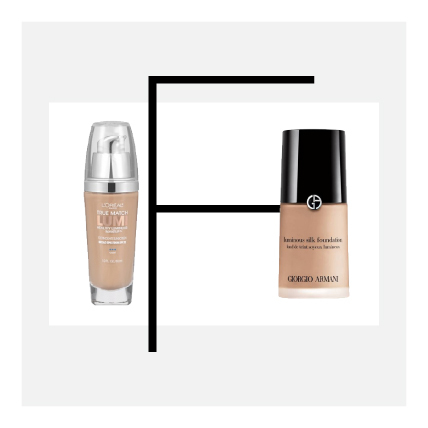 But those who think The One is a $64 bottle of Giorgio Armani Luminous Silk Foundation haven’t met its hotter cousin — the $13 L’Oréal True Match Lumi Foundation. The drugstore foundation offers buildable luminous coverage with a hydrating 40 percent water formula, antioxidants, vitamins C and E, SPF 20, and lasts up to eight hours. There are only 15 shades while Armani has 30, but for $13 a bottle, mixing two shades to customize your own doesn’t sound too awful. (L’Oréal should still step up its shade range though.) Armani’s version has a buildable luminous finish as well, and what it calls “Micro-Fil Technology,” which results in a lightweight-yet-flawless look. Sounds great, but one thing we’ve learned is that a fancy term can just be a fancy term. In fact, here’s something that might blow your mind — L’Oréal and Armani are owned by the same parent company, L’Oréal. Now, we can’t definitely say that both brands are being manufactured in the same labs or have similar, if not the same, formulas, but we also are not not saying that. If you have a traditional car, gas is one of those things that you can’t avoid. Just like tolls and traffic. But if the manufacturer doesn’t explicitly state that your car requires premium gas for efficiency, your car can survive on regular. 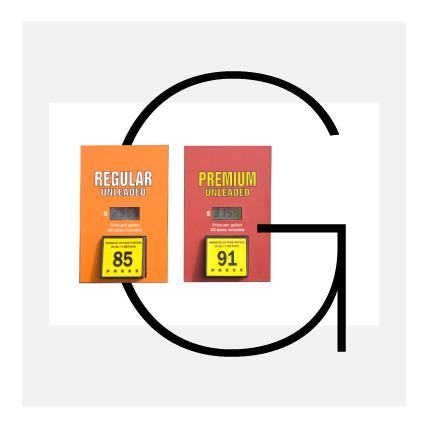 Premium gas is a 91-percent-and-above octane formula meant to help your car perform better, but unless the engine is created specifically to take in all that octane, your car won’t reap any of the benefits. If you want to talk numbers, according to a 2016 American Automobile Association study, U.S. drivers waste over $2 billion annually on premium gas when their cars could run perfectly fine on regular gas. 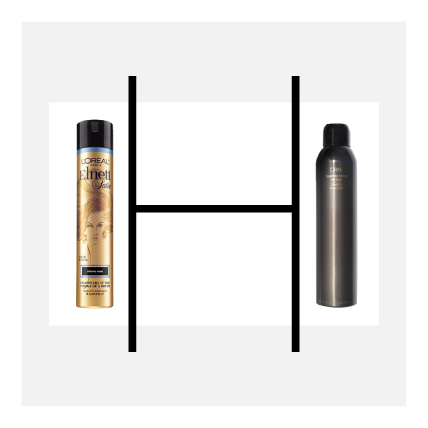 Ask any hairstylist about their favorite hairspray and nine times out of 10, they’ll say it’s L’Oréal’s Elnett hairspray or “the gold one.” It’s the holy grail of hairsprays, first developed in the 1950s and to this day, still looks like it’s from that different era. There are several formulas with different levels of hold as well as scented and unscented versions, but they all hold your hairstyle without being heavy, let you brush through without getting stuck, and clock in under $12. At that price, you could buy three cans of Oribe’s Superfine Hairspray, which are also smaller cans so you’re getting less product per dollar. 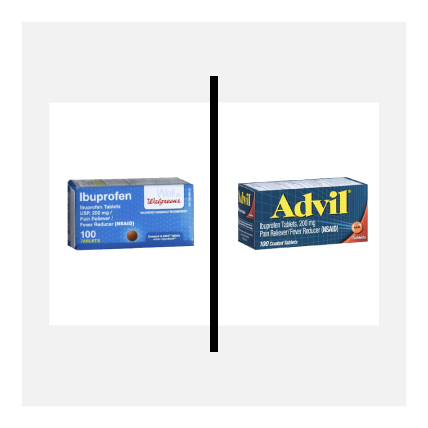 Generic ibuprofen has the same effectiveness as Advil or Motrin, and like we’ve mentioned before, around 8 percent cheaper. Unless you’re an intensely loyal Advil fan for some reason, any store brand is going to cure your headache just fine. 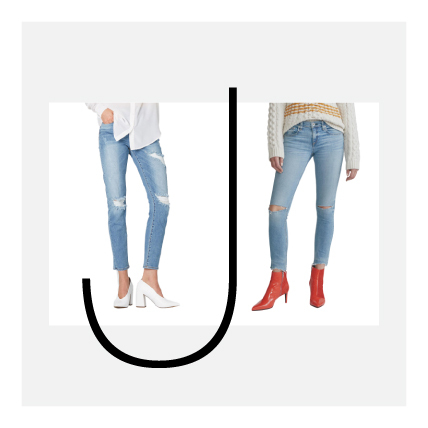 There are clear differences why some jeans cost $10 and others cost $200. But if you were to compare a pair of $100 jeans from DSTLD and a $200 from rag & bone, you might find that the price difference is less justified. Since its 2014 launch, DSTLD has bridged the gap between premium denim with under-$100 jeans. It cuts out the middle-man, delivering quality classic and on-trend denim directly to customers instead of going through a traditional retail model that jacks up the prices. That’s not code for sweatshop conditions either — the brand screens its suppliers and factories to ensure labor conditions are reasonable and up to ethical standards. The result is a quality pair of jeans that makes your closet and wallet pretty damn happy. 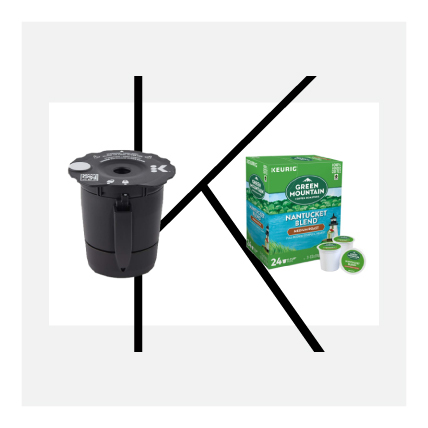 If you have an at-home coffee machine like a Keurig, you’ll understand the plight of having to buy and stock up on single-use pods. Not only are they awful for the environment, they’re also a waste of money. A 72-pack of K-cup pods can cost $35, and don’t forget that you’d have to re-up when you’re all out, too. Meanwhile, a reusable Keurig-branded coffee filter costs just $9. You can fill the filter up with whatever cheap or fancy ground coffee you want, and your coffee will taste the same. 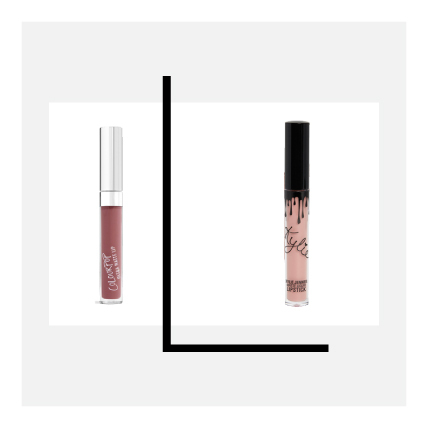 You can’t talk about liquid lipstick without bringing up Kylie Jenner’s eponymous beauty line. The businesswoman and reality star helped make matte lips A Thing over the past few years and capitalized on the trend with her $17 liquid lipsticks and $30 lip kits. But before there was Kylie, there was Colourpop. Since 2014, the brand has been creating inexpensive-yet-long-lasting and highly-pigmented liquid lipsticks for around $6. Users have mentioned that both products look, work, and act the same — yeah, you know where this is going. Both brands are backed by Seed Beauty and manufactured by Spatz Labs, and while Jenner and Seed founders Laura and John Nelson have denied that the two brands have the same formula, they’re so similar that they might as well be the same thing. The French really know how to do effortless skin, even if the packaging looks like it’s never been updated. 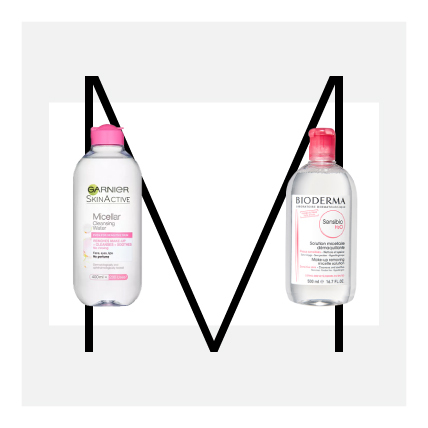 Beauty editors and makeup artists used to stock up on Bioderma’s micellar water before the brand was made available stateside several years ago, and now there are so many cheaper options on the market that are better than the original, like Garnier’s. Named for tiny oil molecules called micelles that draw out dirt and dissolve waxy makeup, micellar water is basically an all-in-one facial cleanser that looks and feels just like, well, water. Garnier’s version not only looks very similar to Bioderma’s in terms of packaging, but leaves behind a refreshing, tingly sensation that users love and is about half the price. With 4.5 stars and over 900 glowing reviews on Ulta, it’s hard to pass up on this beauty steal. 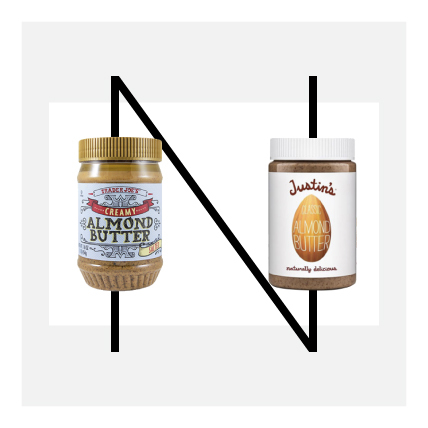 Nut butter fans know that TJ’s has the best almond butter out there — don’t @ us on that. It’s one of the purest nut butters on the market (the salted one includes sea salt and cashews, and the raw one is just all almonds) and the generous 16 oz. jar lasts a long time. TJ’s even dropped the price by a full dollar in 2018, so now it’s just $5.99. A jar of the same size from Justin’s will cost you $13.99, but the only other ingredient besides almond is palm oil. It’s the most popular vegetable oil and has led to incredible deforestation and wildlife loss in Indonesia and Malaysia, where 90 percent of the world’s palm oil is sourced and exported. Unfortunately, palm oil is found in more than half of the U.S.’s consumer packaged goods like lipstick, soap, and detergent, so it’s hard to avoid unless you’re reading labels all. the. time. But when it’s the second and only ingredient in a product and there’s a much better alternative, it’s a no-brainer. 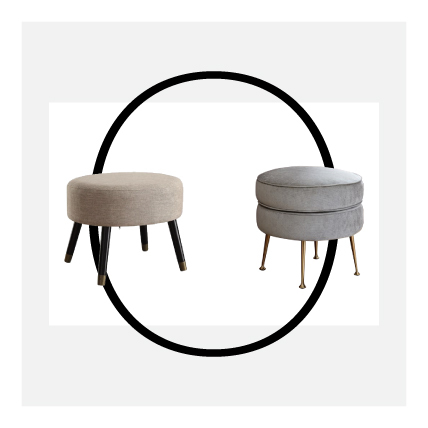 Ottomans are great for adding extra seating around your tiny apartment, but it doesn’t need to cost you a ton. In fact, places like Overstock have similar versions to West Elm styles at a fraction of the price, and look just as fancy. And it’ll come with faster shipping too — this particular mid-century design from West Elm is made-to-order and takes 12 weeks, whereas you can order three of the Overstock stools and get free standard shipping. Now all your friends can sit at your place. 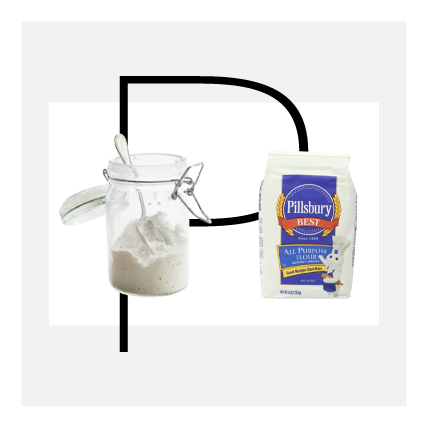 For pantry staples like salt, sugar, pepper, flour, spices, and more, a grocery brand will taste no different than a national brand. That’s because salt is salt, sugar is sugar, and so on — you’re basically buying an ingredient, and the ingredient will look and taste the same despite the label on the package. This one’s a bit of an outlier — the brand name version of cotton swabs is actually cheaper and better than the generic. 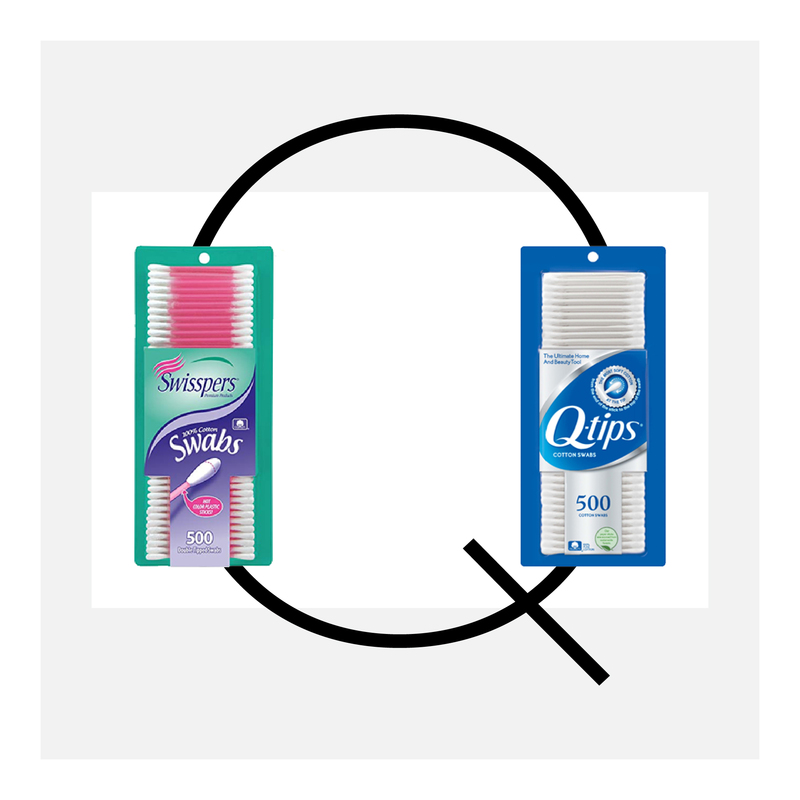 A box of 300 double-tipped cotton swabs from Swisspers costs $4.33 on Amazon, while the original Q-tip brand sells a box of 700 for $4.64. You might be able to find Swisspers on sale more often at a drugstore or online, but know that the tiny stick is made from plastic that is too small to recycle while Q-tips’ is made from compostable and biodegradable wood. 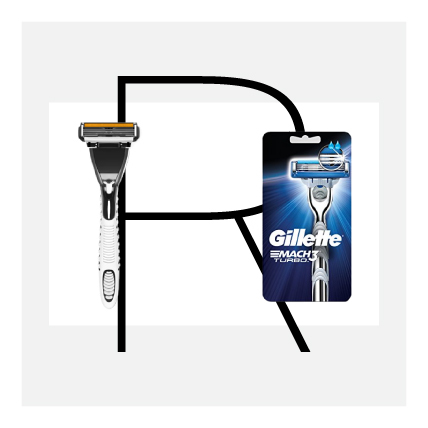 If you’re going to buy a razor, please make it a men’s one. They’re cheaper than women’s across the board. They do a better job because the blades and moisturizing strips are often longer than the women’s version. This means, whatever your gender, running the razor over your legs doesn’t automatically equate to irritated skin. Surprisingly enough, subscription service Dollar Shave Club is significantly cheaper than other mens’ refillable razors like the $9 Gillette Mach3 Turbo. It’s $6 for a box that includes a razor handle and four blades for the first month, and then four blades for each month after. After Hawaii passed a law last year banning chemical sunscreens formulated with the coral reef-destroying ingredient oxybenzone, the amount of mineral sunscreens on the market skyrocketed. 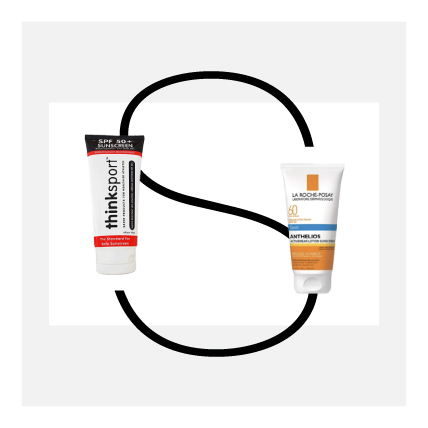 And while drugstore brand La Roche-Posay is always a go-to for affordable sunscreen, Thinksport has it beat this time. Not only is a 6 oz. tube cheaper at $12 compared to LRP’s $30 5 oz. bottle, but the brand is really transparent when it comes to its formula. There’s a list of ingredients that are never found it its products, like phosphates, parabens, or nanoparticles. There is so much mystery around the cult-exfoliating toner P50 — the formula is a blend of alpha and beta hydroxy acids, and you can only get it online at Rescue Spa, or at limited high-end spas, or France. It ain’t cheap to buy or easy to get, which lends itself to an obsessive fan base. Honestly, it’s just hype. SkinCeuticals makes a similar product for a lot less. Just like P50, SkinCeuticals’ formula is loaded with AHAs like lactic, malic, and glycolic that exfoliate, smooth, and moisturize skin. It’s also $34 for a 6.8 oz. bottle — you could buy three online easily and your total would barely cost more than a large bottle of P50 that had a months-long waiting list. 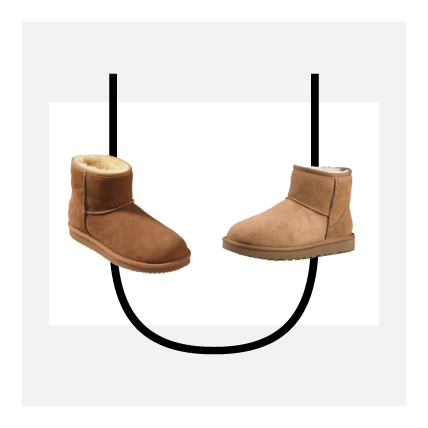 Despite UGGs being deemed the “ugly shoe” by fashion elite, it’s also one of the most ubiquitous come every winter. The sheepskin lining is just too cozy to pass up, but for a $140 pair of the Classic Mini boots, you could get a pair that looks exactly the same from L.L. Bean and save yourself $30. Both versions are made with shearling and have been pre-treated to repel water and stains, and are so similar in style that you’d barely be able to tell them apart. However, L.L. Bean’s version has a slightly sturdier outsole and better traction than UGG’s, meaning you’ll be less likely to slip in the snow, too. Millennial-friendly supplement brand Care/of has really taken off these past few years, but reality check: It’s kind of a scam. 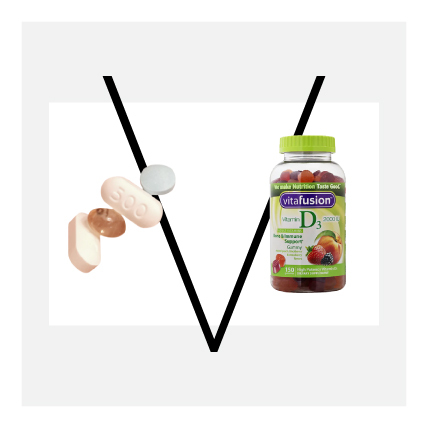 Vitamins are considered dietary supplements in case you’re not getting enough from your food, so they’re not tested or regulated like drugs by the U.S. Food & Drug Administration for safety or effectiveness. Since that’s the case, we’re just not seeing how taking customized vitamins in a pretty package is any better than taking generic vitamins. That being said, if you’re going to take a vitamin, talk to your doctor first to see what’s right for you. More likely than not, they’ll suggest a generic supplement brand that’ll come in a generic jar with a generic label. And guess what? You won’t even notice the difference. Everyone you know probably has several reusable water bottles with one of them being the insulated S’well bottle. You might want to direct their attention to the MIRA bottle, which is a better product for way less dough. 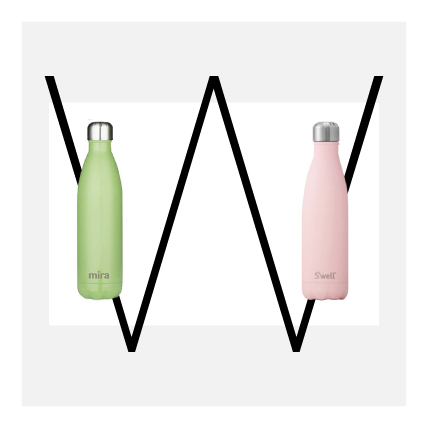 Both stainless steel bottles claim to keep drinks cold for 24 hours or hot for 12 and both come in a ton of colors and sizes, but MIRA’s prices are a lot more affordable for those who constantly forget where they put their bottle. Where MIRA shines is in its durability — Amazon reviewers say that their Mira bottle had less chips and dents than compared to their S’wells. If you do crafts of any kind, you likely need a teeny-tiny hobby knife. Excel Blades may not be a household name, but its soft-grip knife at $3.50 makes a compelling case against the $5 X-Acto version. For starters, it has six colors that fit your personality as opposed to just three, and the lightweight aluminium handle has a soft padding for max comfort as you painstakingly make cut-outs for your scrapbook. 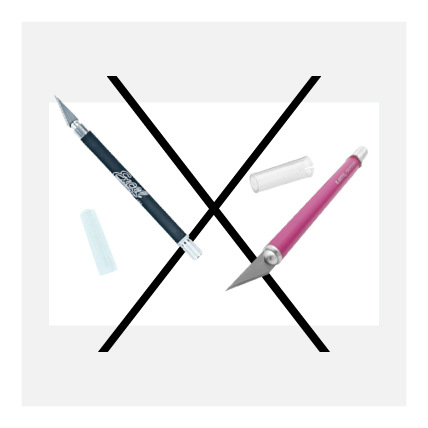 And unlike X-Acto’s version, the safety cap is shatter-proof, which will come in handy because you know you’ll drop it at least 99 times during every project. 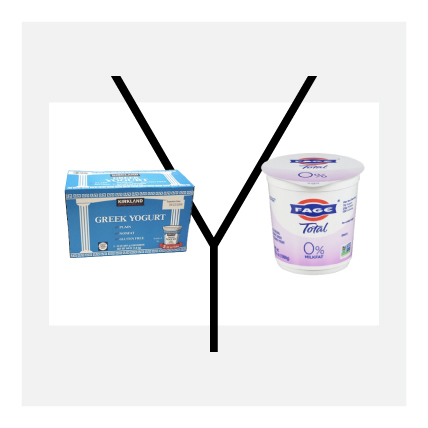 Costco’s in-house label Kirkland Signature makes a ton of quality products, and its Greek yogurt is one of them. It’s got a tangy and tart taste, thick texture, and best of all, comes as a two-pack for less than $8. It’s cheaper than any tub of Fage you’d find on sale at your grocery store. Technically, you’d need a Costco membership since the brand is a private label (or you can just share a friend’s and save even more money), but you can also order from the grocery store delivery service Instacart without getting an additional membership. 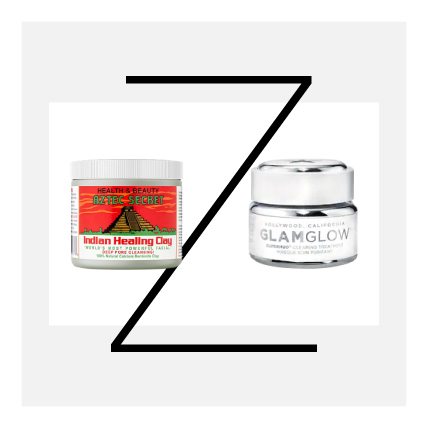 Breakouts can happen to those even with nine-step skin-care routines, so before you find yourself with a huge zit, do yourself a favor and get a jar of Aztec Secret’s Indian Healing Clay on Amazon. It’s so good that it’s earned 4.5 stars from more than 19,000 reviewers. The all-natural bentonite clay clears dirt and grime from every pore on your face so acne-causing bacteria doesn’t stand a chance. You can mix the powder with water to create the mask, or apple cider vinegar for an even stronger version. Oh, did we mention a one pound jar is only just $11? Yeah, it’s safe to say that it’ll last way longer than GLAMGLOW’s acne-clearing charcoal mask, which costs $60 for a small 1.7 oz. jar. The mask’s first ingredient is also water, which is a filler ingredient that does nothing to boost the product’s efficacy.